Find the best deals on sous vide cooking tools for Black Friday 2019 here at Funtober. We will be scouring the advertisements over Thanksgiving weekend for Anova, Chefsteps and other sous vide tool manufacturers. We will post the best sales from Thanksgiving Day to Cyber Monday 2019 on them here as soon as they are posted online in November. Sous vide is a technique using precise temperatures to cook food using longer than normal cooking times and lower temperatures. It means “under vacuum” in French. High-end restaurants have been cooking with it for years. The technique has been brought home to kitchens by new tools that provide for using the technique affordably. Once a technique used only in the fanciest of kitchens, sous vide (French for under vacuum and pronounced “soo-veed”) is precision cooking you can now do at home. Meat is vacuum sealed in plastic or silicone bags, submerged in water, which is circulated and heated at precise temperatures for precise times, before you sear or broil your dish for a finish and serve. 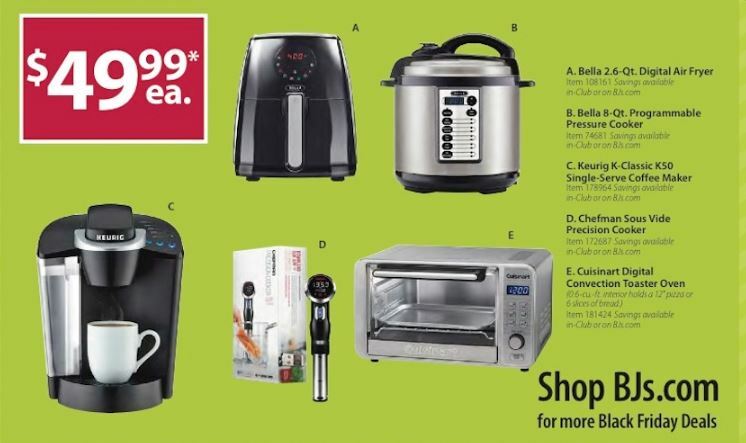 Tools that attach to the sides of pots and can be set for exact temperatures and times are now available in many stores and online, for prices that you can afford! There are even sous vide settings on pressure cookers like the Instant Pot Ultra. 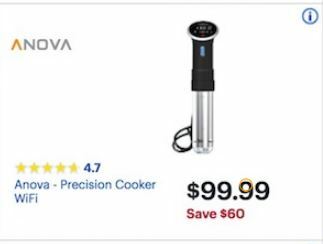 Anova Culinary: a San Francisco-based smart kitchen company that makes a sous vide precision cooker. Chefsteps Joule: A small and powerful immersion circulator made by Chefsteps, a Seattle-based smart kitchen product company. Kitchen Gizmo: A kitchenware company offering practical and stylish kitchen tools. Gourmia: They are a Brooklyn, NY headquartered company making a line of sous vide immersion cookers which includes the GSV150B. Bernzomatic: They make a fast tool for searing the food so that you don’t have to finish it in a pan. It is called the TS8000. Booker and Dax: They are a food science development company that makes the Searzall, a cone-shaped attachment added on to the TS8000 for searing. We will be tracking down the best deals and discounts as Black Friday 2019 approaches and posting them here. There are still a few months before stores and manufacturers. We hope you will return then!